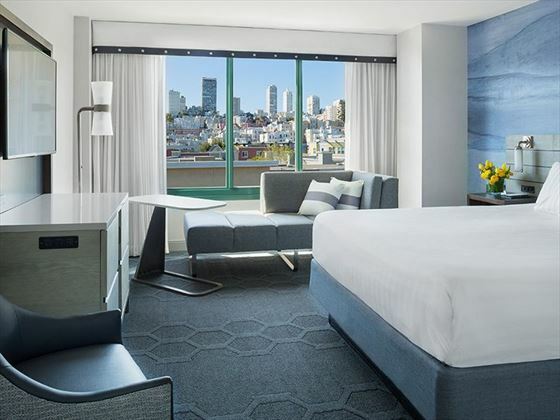 A comfortable property that serves as a wonderful base for your San Francisco adventure, Hyatt at Fisherman’s Wharf is located in a prime position for visiting the sites. Just moments from Pier 39 and Ghirardelli Square, you’ll also find the famous cable cars nearby where you can hop on and explore the sights, from Lombard Street to North Beach. Each of the spacious rooms boasts contemporary décor and is well-equipped with all the amenities you’ll need for a relaxing stay. You’ll find a host of culinary offerings at the two on-site restaurants, with freshly prepared dishes and local Napa Valley wines to enjoy. If you want to soak up the sunshine without leaving the hotel, there’s a sundeck and heated outdoor pool to make the most of too. Located in the Fisherman’s Wharf area of San Francisco, this hotel is within easy reach of Pier 39, Ghirardelli Square and the historic cable cars to take you on a scenic journey through the city. The Golden Gate Bridge and ferry port to Alcatraz are also nearby. Hyatt at Fisherman’s Wharf is also two miles from the 18-hole Presidio Golf Course. The hotel also offers room service.